When you look at your website’s Google Analytics data, you can find out which social media networks are driving traffic to your website and the pages to which those social networks drive traffic. You can even use Google Analytics to find out which social media users tend to convert into leads and customers with the use of goals and conversion tracking. But what you can’t find out from standard Google Analytics reports is the type of social media link that drove the traffic to your website. Was it a link in a Tweet or the link from your Twitter bio? 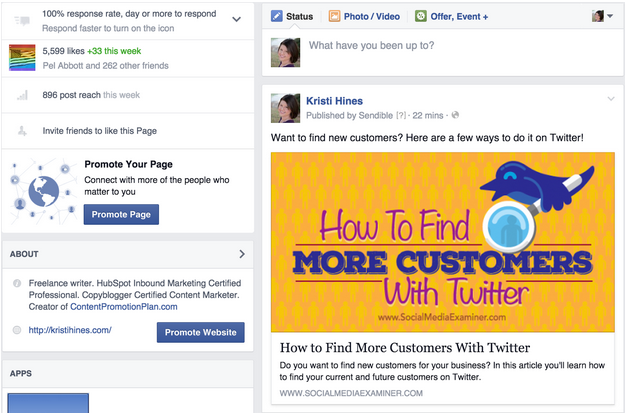 Was it a click from a link that you shared on your Facebook Timeline or was it from an ad? Was it a click on a link shared in a LinkedIn Group or in someone else’s LinkedIn news feed? This is where UTM parameters come in handy. In this post, we’re going to show you what UTM parameters are, how they work in regards to social media network referrals and the various ways you can use them to identify specific social media traffic. UTM parameters are not complicated things that only advanced marketers can use. They are simply tags that you add to the end of a URL to tell Google Analytics more about a link that someone clicks to get to your website. 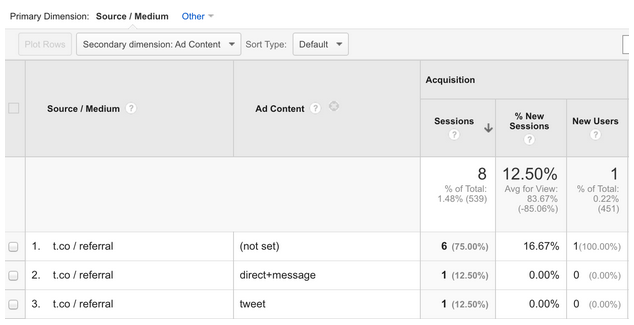 UTM parameters are used to track custom campaigns in Google Analytics. The Campaign Name (utm_campaign) parameter tells Google Analytics how to group traffic from a specific campaign you are tracking. An example of a campaign name below in our Google Analytics example via the Acquisition > Campaigns > All Campaigns report is “Product Update,” as this was part of an email blast sent about a product update. The Campaign Source (utm_source) parameter tells Google Analytics where traffic originates from. Examples of social media sources that you will see in your Google Analytics in the Acquisition > All Traffic > Source / Medium report include facebook.com, t.co and stumbleupon.com. The Campaign Medium (utm_medium) parameter tells Google Analytics the type of traffic source traffic originates from. The medium that you will see in your Google Analytics in the Acquisition > All Traffic > Source / Medium report related to social traffic will be referral. 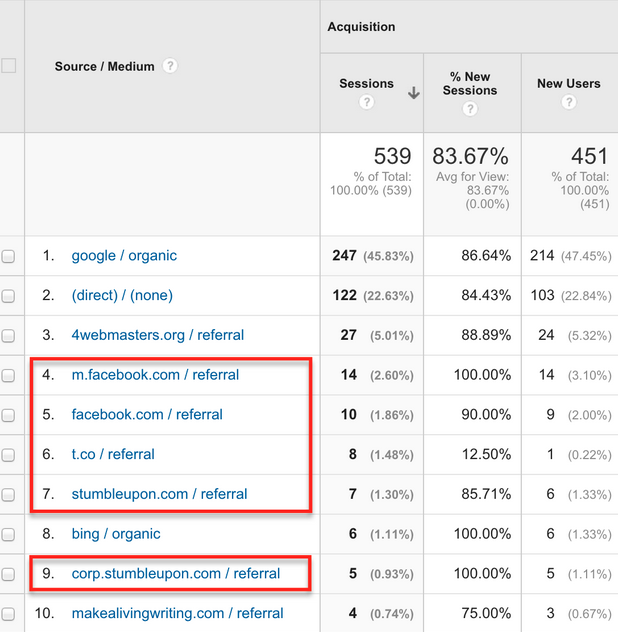 Here are standard sources and mediums in action in the Acquisition > All Traffic > Source / Medium report. Google Analytics uses standard sources and mediums for all traffic to your website, regardless of whether you specified a custom campaign. For social media traffic, it identifies specific sources and separates them in the Acquisition > Social > Network Referrers report. You can hover over each network to see what sources it specifically links to that network. The Campaign Term (utm_term) parameter tells Google Analytics the keyword you use to target paid ads. This is mostly linked to Google AdWords campaigns, although you can use them for any custom campaign. 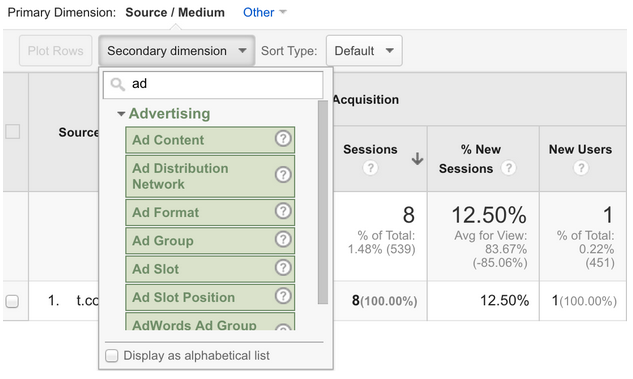 The Campaign Content (utm_content) parameter tells Google Analytics the type of ad that someone clicked upon. This is mostly linked to Google AdWords campaigns, although you can use them for any custom campaign. Let’s say you want to share the following link in a Tweet and in a Direct Message. Let’s say that eight people visit your website from Twitter. Two people click on the link above, one from the Tweet and one from the Direct Message. The rest click on other links to your website that were shared on Twitter. Google Analytics will show you eight sessions originating from a t.co / referral in the Acquisition > All Traffic > Source / Medium report. There won’t be a way to distinguish between the click from the Tweet and the one from the Direct Message. Now, let’s say that you append the following UTM parameters to the link you share in a Tweet and the link you share in a Direct Message. In these examples, you have a Campaign Source (utm_source=t.co), Campaign Medium (utm_medium=referral), Campaign Content (utm_content=direct+message and utm_content=tweet) and Campaign Name (utm_campaign=promo). 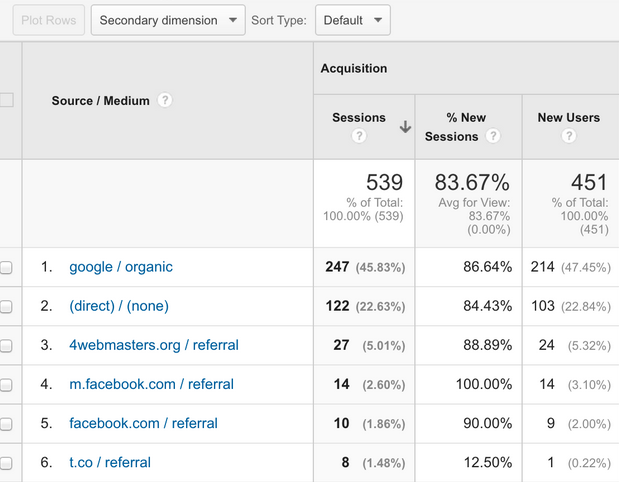 In Google Analytics, you will still see the same number of sessions originating from a t.co / referral in the the Acquisition > All Traffic > Source / Medium report. Click on the t.co / referral link and then use the Secondary dimension drop-down at the top to find Ad Content. You will now see the sessions from the Tweet (tweet) and from the Direct Message (direct+message) you are tracking with your UTM parameters separated from the other sessions without parameters (not set). This is because of the bolded parts of the following URLs you shared. These parameters told Google Analytics which clicks came from your Tweet and which ones came from your Direct Message. You can also find information about your campaign based on the campaign name you chose by going to the Acquisition > Campaigns > All Campaigns report. 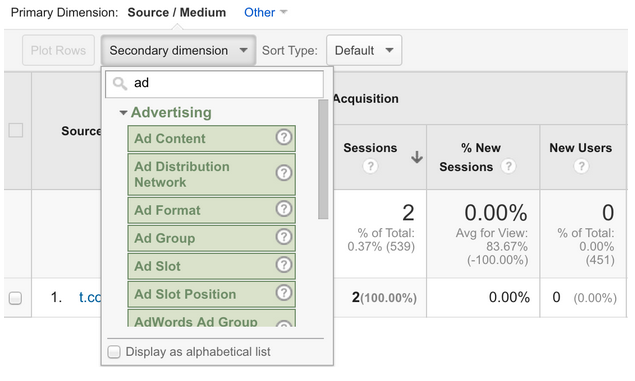 From here, you can click on your UTM parameter campaign (promo) and then use the Secondary dimension drop-down to find Ad Content. Then, you will see the specific breakdown of which links your visitors clicked upon based on your tags. In summary, the UTM parameters can help you identify specific referral traffic you receive from social networks from both the Acquisition > All Traffic > Source / Medium and Acquisition > Campaigns > All Campaigns report. 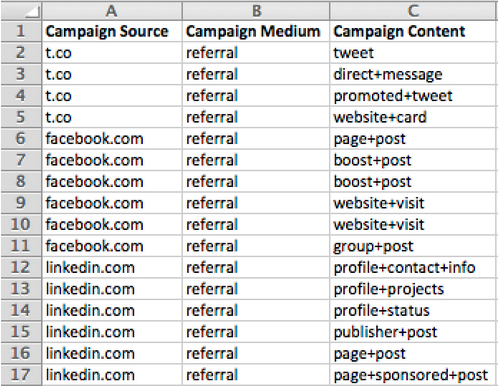 As you can see from the earlier example, URLs with UTM Parameters are long. Therefore, you only want to use UTM parameters in two places. Places where the full URL will not be displayed. Places where you can share Bit.ly or other shortened links. For example, here’s what a standard URL with UTM parameters would look like in your Twitter profile website field versus in a Tweet with a Bit.ly shortened link. In this case, you would either want to use a Bit.ly link (or other shortened link) for your Twitter profile’s website field, leave off the UTM parameters or have a link that shows them. It’s also worth noting that people seem to be more comfortable clicking on Bit.ly’s in a Tweet versus in a profile website link. 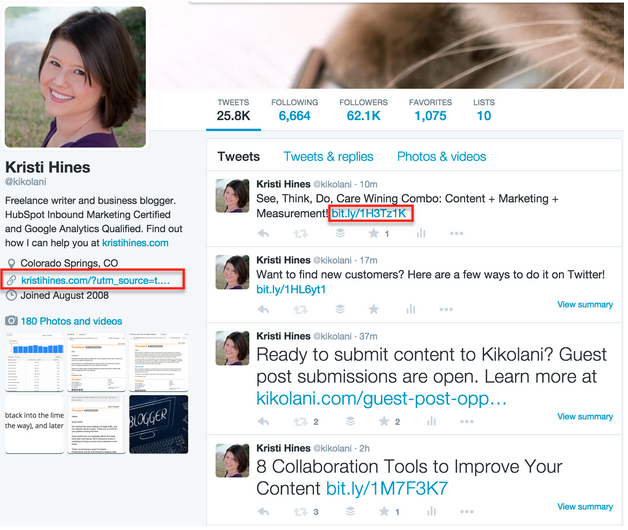 Hence, it might be better just to show off your link in your profile’s website field sans the parameters. On your Facebook Page, you can add UTM parameters to your Page’s website field without having them shown in the About box. Note that if you try to add UTM parameters to the URL in your Short Description, you will simply run out of room because of the character limit. Links in updates are masked, so UTM parameters can easily be used with those. 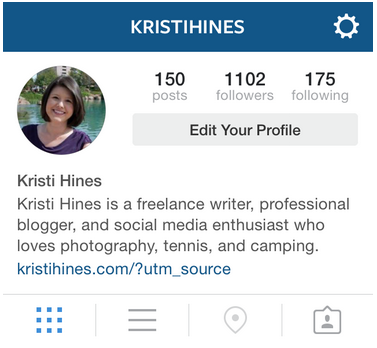 On Pinterest, you will see the UTM parameters on your profile, but not on your Pins. On Instagram, you’ll see a part of your UTM parameters (depending on the length of your profile) in the app and all of it on the desktop. 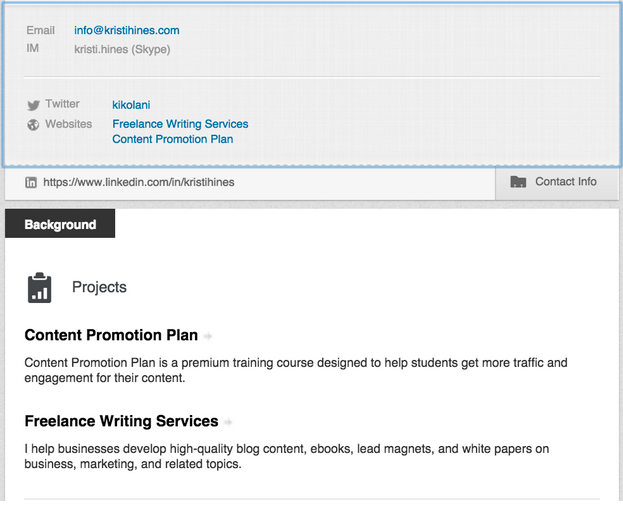 On LinkedIn, the URLs on your personal profile use anchor text. But the ones on your Company Page are shown in full. Hence, you will want to test UTM parameters in various areas on your social profiles and pages to see where you can use them without showing off a long link or decide whether or not you want to use a Bit.ly or shortened URL. Here are some ideas of social media links you would want to distinguish clicks from using UTM parameters. Twitter: Links shared in Direct Messages, Tweets, Promoted Tweets, Website Cards and other advertisements. Facebook: Links shared on your Facebook Page (main website link), posts to your Timeline, boosted posts, website visit ads and website conversion ads. LinkedIn: Links shared on your personal profile, status updates from your profile, as status updates on your Company or Showcase Page, status updates in Groups, Sponsored Updates and standard ads. Pinterest: Links shared in Pins and Sponsored Pins. Distinguishing clicks from these specific social media links will allow you to determine what types of posts are leading to the most traffic and conversions for your business (if you are using Google Analytics goals, that is). While the URL looks long and complicated, it’s actually easy to create if you use Google’s URL Builder. You just tell the builder your URL and the tags you want to use. The key to remember when creating custom campaigns using UTM parameters is that the UTM parameters must be consistently formatted. For example, the use of utm_name=promo, utm_name=Promo and utm_name=PROMO would result in three different campaigns. Similarly, the use of utm_content=direct+message, utm_content=direct message and utm_content=direct_message would result in three different Ad Content types. Hence, you need to keep track of the custom campaign UTM parameters you create. You might want to do this in an Excel document. 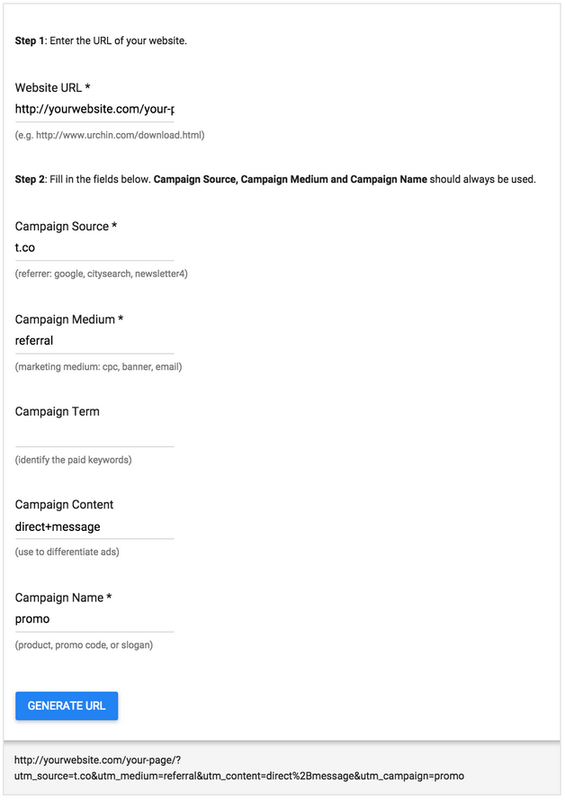 This will help you keep consistent UTM parameters across all of your campaigns. 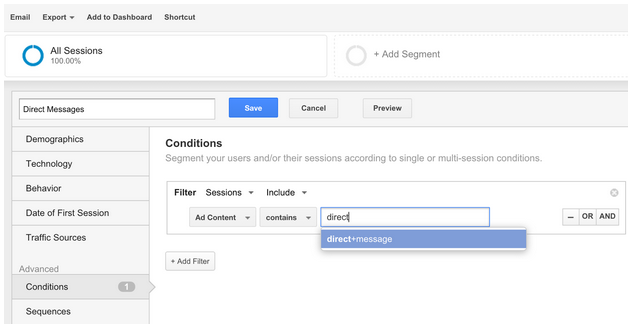 After you run several campaigns, consistency will help you use the Segments feature of Google Analytics to see all of your traffic from Direct Message campaigns. At the top of any of your Google Analytics reports, you can click the Add Segment button and then click the New Segment button. Then configure a segment that looks like this. You can then see all of your traffic from Direct Messages based on the utm_content=direct+message parameter you set up. You can create different segments, such as one for your utm_content=tweet, and then view both to see the difference in traffic from Tweets versus Direct Messages. We hope you’ve enjoyed this introduction to tracking your social media campaigns with UTM parameters. Have questions? Please let us know in the comments.